As I told you before, we have a feisty new Irish red head in town. She’s mighty pretty, and I think we’ll end up really good friends, but boy is she a mean one when she gets riled! There’s been several times I’ve experienced just how mean she could be – and today was no exception! Even though we were doing nothing wrong…well, you see…Mark, Micah and I were merely standing outside Micah’s office when Lou walked by. We were just minding our own business, mind ya'. But when Lou walked by, Micah just HAD to say hello! “True,” I agreed. “But most people still think you tricked them. That can happen in a small town. You’re gonna just have to give them time to uh…get over it.” Micah told her she shouldn’t be angry. Micah interrupted her. “Did you say…girls?” She did! They would be in on the Denver stage this afternoon! “In the hotel?” I was shocked! “Well, you don’t expect me to run the whole place by myself…or do ya'?” She turned and stomped off. Mark’s mind was whirling. “Girls,” he breathed. 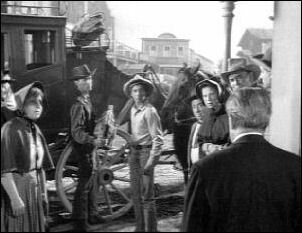 Well, we decided to hang out in town until the stagecoach arrived. I reckon we were all curious about Lou’s “girls.” Mark sure was! The minute he saw the stagecoach coming, he came running into Micah’s office and told us it was here. Then he hurried over to the hotel to tell Lou it was coming. As soon as the stage stopped, the driver told Micah to get Dr. Burrage. “I’ll get him,” Mark said. The driver announced that they had a really sick passenger. When the driver opened the door, Betty said, “Miss Lou, I’m real sick!” She asked Molly what was wrong with her, but she didn’t know. “She’s sick, that’s what’s wrong with her,” the male stranger answered. I stood back watching as the ladies started to get off the stage. Suddenly, Betty went limp on Lou. She asked me to help and I carried her into the hotel. After all the commotion and as the people started to go on their way, Micah noticed a familiar looking stranger get off of the stage right behind the ladies. 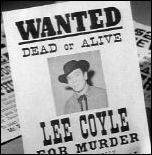 He looked at Micah, then walked into the hotel and Micah went to his office to check out the wanted posters. When Dr. Burrage got to the hotel, he told Mark to wait outside. Then he hurried into the hotel. Betty had a fever, but the doctor didn’t know what was wrong with her yet. Molly told us that Betty must have had the fever when they left Denver, she knew when they left she wasn't feeling very well. That would make it about two days that she already had the fever. “You do as I tell you!” Dr. Burrage ordered the rest of the people to leave. There was nothing there to interest them. Then he told the driver to take the stagecoach and the baggage outside town. Everyone was confused. We didn’t understand what was going on! “And Mark, you get Micah and tell him I want to talk to him outside.” Mark nodded, but he didn’t move. The stranger suddenly wanted to know what was wrong with the woman. “Well, I ain’t sure. Two days now. High fever and aching and…the way she looks. If the fever breaks, we’ll know. If it don’t break…well, we’ll know anyhow. "Spell it out!" The stranger ordered. "Smallpox.” When I heard that word, fear came over me. You’ll soon find out that this hit very close to home! Fear gripped me! Of all the diseases in the world, this just HAS to be the worst possible thing we could have been hit with! I rushed toward the door. "Mark!” I suddenly shouted. “You heard the Doc! You get Micah and you stay out of here!" Mark just stood there. I could see the worried look on his face. The last thing we wanted to do was leave me there. He couldn’t go through that again! "Go on Mark," I said more gently. He knew he had no choice. "Yes sir," he obeyed me. He then ran over to get Micah. Lou asked the Doc if there was any chance he could be wrong. He said he could be, but she was showing all the signs of smallpox and didn't want to take any chances with the town. "The town...what about us? We were on the stage with her, all of us in here. We touched her!" The stranger declared. The Doc told us he was quarantining the hotel and nobody was allowed in or out with no exceptions. "You mean...maybe we got it right now?" Asked the stranger. Doc said if we didn't have it before there was a chance we could get it now and that you couldn't get it a second time. I asked the Doc about himself, he said he didn’t have to worry. Micah was going through his wanted posters when Mark ran into his office. "Micah...Doc Burrage wants to see ya'!" Micah kept going through the poster. "Micah!" "What's wrong?" Asked Micah. Mark told Micah about the smallpox. He was surprised. Mark told him that the Doc didn't want anybody inside of the hotel and that Micah was to come to the hotel and wait outside until he came out. "What about the others, your father?" "I guess they're have to stay there," said Mark. Just them Mark noticed the poster Micah was holding, it was a poster of the man who was on the stage. Micah went over and took his shotgun out of the gun rack and headed for the hotel. The Doc told Lou to take her onto a cot in the dining room. She needed plenty of blankets because she was chilling. “But we’re all quarantined!” Lou told him. "You can stay here if you want lady. Do whatever the Doc say. Me...I'm takin' my chances some place else," said the stranger. "You'll take your chances with the rest of us!" I said. He drew his gun on us. "Nobody gives me orders! Nobody!" He then cocked the hammer of his gun. Doc spoke up then. "My friend...you've been exposed to smallpox. If you've never had it your chances of getting it are very good! Would you like me to describe what it's like, it ain't a pretty picture, not pretty at all!" "I'm not staying here and make sure I get it!" The stranger declared. He then opened the door to the hotel and was about to start out when Micah approached him with his shotgun. "Don't move! I said don't move! Now raise your hands! Take his gun Lucas!" I walked up to him and took his gun away from him. "Alright Coyle, turn around," said Micah. He was surprised Micah knew his name. He’d dropped out of sight for awhile. “Lucas, this here’s Lee Coyle. He’s wanted back in Kansas. Two murder charges.” Micah ordered him out. Doc told Micah we might have a chance. “There’s a new serum they get from cows. If we can get some, it’ll help us.” He went on to tell Micah that we'd have to find a town that had a case of cowpox since the serum is made out of the blood that they get from the infected cows. Micah told the Doc he would send out wires to every town, every town within a hundred miles. “Well sure…I reckon, but…but Pa, if it’s all the same to you, I’ll see if maybe I can bunk in the night with Nils. I mean, I’d be right up the street and…” I told Mark that would be alright. Maybe he could take him up on a game of checkers. He was two up on Mark now. “Alright.” Mark turned, but he couldn’t leave. He was so very worried. “Uh Pa?” I turned and looked at my boy again. “I hope everything turns out alright." “I’m sure…” I started. But we remembered another time when it didn’t. I couldn’t be sure it would. And I wouldn’t tell him it would. "I hope it does too son." He turned and walked away and I closed the door to the hotel. As I closed the door, Coyle stood up. He laughed at me. Then he turned and looked at the crates of whiskey. He thought he’d have himself a drink. “Stay where you are, Coyle!” I ordered. But he knew I couldn’t shoot him. Anyway, what did he have to loose?” He said either he was going to die from the disease, I was going to shoot him, or he was going to hang. He had nothing to loose. He took a bottle of whisky out of the crate. Then Lou came in. You know Lou…”You drink that whiskey, mister, you pay for it!” He then threw a coin right at her face. I caught it before it could hit Lou. The Doc, Lou and Molly started moving Betty to the other room. I got distracted when they almost dropped her. When I turned to help them, Coyle called out to me. As soon as I turned around, he threw his drink in my face. 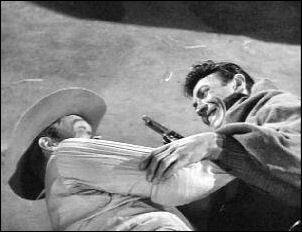 Then he took the pistol from me and knocked me out. Coyle just stood there laughing. “Well, that’s a lot more like it!” He told the others to pull down the shades and lock the door. Doc wanted to take care of the girl, but Coyle wanted to think. When he checked outside he could see Micah and several men guarding the place. After investigating the street, he gave Doc permission to take care of the girl. I started coming around and Doc bent down to check on me. Coyle ordered him to leave me alone. Coyle ordered me to sit down in a chair. Doc helped me get there. My head was still aching! Meanwhile, Mark was having a really hard time with this. It brought back so many memories – memories he had buried deep inside him. He waited at the Blacksmith’s for Nils to get there. Nils was surprised to find him there. Nils had just taken out his whisky bottle when he saw him. Mark asked Nils if he could bunk with him that night. Nils said yes. “You hear about it?” Mark asked then. “About what?” Nils asked then. “Oh, you mean the smallpox. Yeah I heard about it first thing I got in town.” Not thinking, he started to offer Mark a drink. But he changed his offer to a drink of water. They decided to play a game of checkers. “But if you’re gonna even up the score, you’ve got to concentrate. You can’t go thinking on anything else, now!” Nils declared. Mark thought on me over at the hotel. Mark suddenly had to check to see how I was doing. He told Nils he’d be right back. I asked Coyle if he’d figured a way out of here. He said he’d wait until after dark. Then he could take the marshal and deputy and escape. “Then what do you do? Just keep running until you drop dead in your tracks?” Doc asked. Coyle didn’t like that. I reminded Coyle that a gun was nothing against small pox. Doc and I played on his fear of the disease. We tried convincing him that he was going to get the disease. The only way for him to walk out was if that serum got here in time. Just then Lou came through the room with an arm full of clothes. Coyle knocked the clothes out of Lou's hands and grabs her. He ordered Doc to the door to see if Micah had heard anything. “You try to tip him off – or do anything else – and you got yourself another patient!” He had the gun right in Lou’s face. “Doc, aren’t those clothes supposed to be burned?” I asked then. Doc said they were. That got him away from Lou and really spooked him. We’d all touched those close at one point! “How come now you tell us to wash our hands? How come now you tell us?” he screamed. Doc said he wasn’t given the chance. He threatened to kill all of us if we pushed him too far. He was really scared! “He’s fine, Mark,” Doc answered. “Well…He’s busy. Maybe later,” Doc answered. Micah asked if he was having any trouble. Doc assured him everything was fine. Coyle knew Doc had tried to tip off the Marshal. The Doc went to tend to Betty and Molly went to make some broth. Coyle told her to hold it. “I won’t try to run. If I go out after being in here, I’d be a killer just like you!” Molly declared. Coyle didn’t like us talking. He again told Lou to sit down. She again ignored him. “Somehow I feel like this is all my fault. I’m sure they think so too.” She just looked at me as she talked. “How can you blame yourself for this?” I asked her. Coyle turned to Lou. “Listen to me!” But he was ignored. “It’s not because I brought Betty here to work. Only a child would blame me because Betty came down with the smallpox. It’s the way I’ve acted since I’ve been here. I know what my attitude was. You once said I have a chip on my shoulder.” I opened my mouth to argue, but she didn’t let me. “Well, you were right. My Dearly departed father always said if you ask for your comeuppance, you’ll get it. Well…this is mine. For someone who…really wants friends and doesn’t know what to do about it…I guess I take first prize. Coyle started yelling at Lou again. But suddenly, Doc called to her. He needed her help. “What’s that mean?” Coyle wanted to know. "I was just thinkin'...this is probably the first time in your life you ever ran up against something you couldn't shoot at and kill." He told me to shut up. 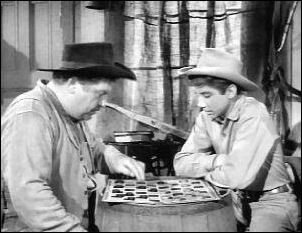 Mark couldn't concentrate on his and Nils checker game. Nils told Mark not to worry, that he had seen me in tougher situations then this. “Besides, smallpox ain’t sure death.” Mark shot his head up and stared at Nils. Nils nodded. “Yeah…I’ve seen it, boy. It’s uh…” He couldn’t’ finish. He again told Mark to concentrate on the game. But Mark was thinking back to a long time ago – another life…another town…”I saw it once back in Oklahoma. I was only six, but…but I remember the sight like it was yesterday.” That’s why this was so hard for him – he watched his own mother die from this horrid disease. Mark had to do something. He left for the telegraph office to see if there was any news on the serum yet. Lou sat with Dr. Burrage as he examined her. She was breathing better and her fever was down. Doc told her he was sure about what it was. “Are you positive?” she asked. “Of course I’m positive!” Doc declared. He showed her the spots. When molly brought in a tray of food, Coyle ordered her to come to him. He asked her to have a drink with him. She didn’t want to. I couldn’t see him doing this. I stood up to make a move towards him. He cocked his gun and pointed it at me. "Don't try!" Just then, Lou came out from the dining room. "Why shouldn't he try it? We're all going to be dead anyway!" Coyle turned to her. "What do you mean?" "The fever’s broke...these are the blankets off of her bed...she soaked them through. When we took them off we saw it! She's breakin' out...you know what that means? There's nothing anyone can do now it's too late! It's too late even if the serum gets here!" She took tiny steps toward him as she spoke. "What are you saying?" Coyle yelled. She took another step toward him. "Didn't you hear me? She’s breaking out! There's nothing anyone can do now .unless.....we might have a chance…we might have a chance if we burn these blankets! Here Mr. Coyle you do it!" she yelled. Then she threw the blankets at him. They landed on top of his head. I lunged forward and threw him to the floor. But he held firmly to the gun. We struggled with it. I tried taking the gun from him. He pointed the gun right in my face, but I suddenly shoved his hand back and threw him to the floor. When I did, the gun went off. Coyle lay dead on the floor. It was finally over. Hearing the gunshot, Micah started banging on the door. Doc ran to open it. “What’s going on in there?” Micah asked. I couldn’t believe it! “Hold it, Mark!” I ordered. “What's the matter with you Doc?" I asked. "Nothing to you to worry about. Mark has had the measles.” Mark stared at Micah in surprise. Then he looked at me. I turned and looked at Lou who had a big smirk on her face. “I've made mistakes before. Measles…chickenpox…smallpox..the symptoms are all the same. You just have to wait." I walked up to Lou. "Measles huh?" She gave me this innocent look. "Well…I had to think of something.” She looked up at me and smiled. I just stared at her. She was something indeed! The next day, Micah, Mark and I were standing outside the hitching post again. We saw Lou walking from the General Store with an armload of packages. The men tipped their hats at her as she passed. Mark and I greeted her. This time, I said good morning. You know Lou…”There’s nothing good about this morning, Lucas McCain!” she declared. Oh no, here we go again! “I’ve never seen the likes of it! “The likes of what?” I asked as I took her packages. “Is there anything we can do to help?” Micah asked. Mark sighed. “Women!” he declared. Micah and I turned and looked at him in shock. He decided to add to that to save his hide. “But what would you do without them?” Then he smiled. I turned and looked at Micah. Micah laughed while I shook my head in disbelief! You never know what’s going to pop out of that boy’s head next! piddlin' stuff.....Patricia Blair as Lou Mallory. Patricia was first introduced to us in the episode Lou Mallory. She played a hot-tempered Irish lass who was a razor-sharp businesswoman. She joined the cast in the fifth and final season and appeared in seventeen episodes. 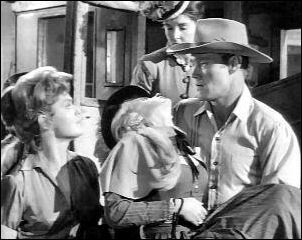 Patricia replaced Joan Taylor who played Milly Scott owner of The General Store. Ed Ames played Lee Coyle. He was the stranger, the wanted man in town. Maureen Dawson played Molly Carpenter. She was one of the girls Lou sent for, the one who told Lou about Betty being sick. 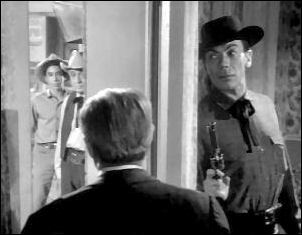 Ralph Moody appeared in a total of twelve episodes of The Rifleman beating John Anderson and John Milford out at eleven episodes. He appeared in nine episodes as Doc Burrage and in three other episodes. The Visitors as Jonathan Dodd — The Spoiler as Roy Merrick and The Hangman as Eban Muchen. Doc Burrage: Six Years and a Day ― The Actress ― Dark Day at North Fork ― The Mescalero Curse ― Man from Salinas ― Quiet Night, Deadly Night ― Mark's Rifle ― Conflict ― Requiem at Mission Springs. Joe Higgins played Nils Swenson. Is it Nils or is it Nels/Niles? What is his last name.....Swenson/Svenson aka The Blacksmith? Joe Higgins holds the record for playing Nils or was it Niles or Nels? There were four episodes that Joe did not play Nils or was it Niles or Nels? He played the bartender in Strange Town — Rafe the blacksmith in The Wyoming Story part 2 — Short Rope for a Tall Man as Henry Schneider the horse thief — Stopover as Scotty the Stagecoach Driver. Stopover was the only episode to run one day over schedule. Carol Leigh played Betty Lind. She was the one who had the measles. Buddy Roosevelt appeared in four episodes ― Panic ― Two Ounces of Tin — Quiet Night, Deadly Night as one of the townsmen ― Death Never Rides Alone as a barfly.